This beautiful half-lit view of Enceladus bears a passing resemblance to similar views of Earth's own only natural satellite, the Moon, but the similarities end there. Earth's rocky Moon, as you know, is covered in (---> by) dark, Volcanic Basins and brighter, Mountainous Highlands - both exceedingly ancient. The Surface of the icy Saturnian moon Enceladus, instead, is uniformly bright (as a matter of fact, far brighter than Earth's Moon). Large areas of Enceladus' Surface are characterized by youthful (on Geologic timescales of course), wrinkled Terrains. 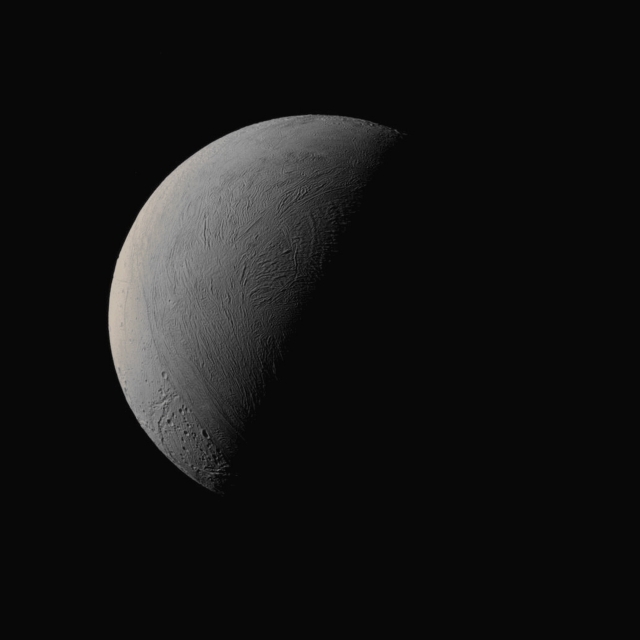 Just out of curiosity, although the North Pole of Enceladus was in the darkness when the NASA - Cassini Spacecraft arrived at Saturn, the march of the seasons out there have brought Sunlight to the Enceladian Northern Territories, and taken it from the Southern ones. This view looks toward the Leading Hemisphere of Enceladus; North is up. The image was taken in Visible Light with the NASA - Cassini Spacecraft's Narrow-Angle Camera on September, 8, 2015. The view was acquired at a distance of approximately 80.000 miles (such as about 128.747,2 Km) from the Surface of Enceladus; the image scale is roughly 2530 feet (such as approx. 771,144 meters) per pixel. This frame (which is an Original NASA - CASSINI Spacecraft's b/w and NON Map-Projected image published on the NASA - Planetary Photojournal with the ID n. PIA 18351) has been additionally processed, contrast enhanced, magnified to aid the visibility of the details, Gamma corrected and then colorized - according to an educated guess (or, if you wish, an informed speculation) carried out by Dr Paolo C. Fienga - in Absolute Natural Colors (such as the colors that a human eye would actually perceive if someone were onboard the NASA - Cassini Spacecraft and then looked outside, towards the Saturnian moon "Enceladus"), by using an original technique created - and, in time, dramatically improved - by the Lunar Explorer Italia Team. Different colors, as well as different shades of the same color, mean, among other things, the existence of different Elements (Minerals) present on the Surface of Enceladus, each having a different Albedo (---> Reflectivity) and Chemical Composition.